Favorite toy: All of my cuddly toys! Favorite activity: Having a cuddle with mummy! Special talents: Able to sleep on a washing line - well thats what my Mum says! 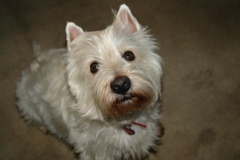 Most embarrassing moment: Walked into a lamppost as I was too busy looking at a gorgeous female Westie. Miss Betty - this was before I knew you though!!! Most trouble I ever got into: Never - I am a very good boy! Honest! My favorite friends: I have a girlfriend called Betty who is too lovely for words!! Biggest adventure: Visiting Bob at his house and meeting Sam, the Minkies, Molly. Mum says it was her biggest adventure too as I decided to do a runner and she was not a happy bunny! You should have seen her face!!! OOps! !